For the album: Mr. Teo Loon Tong, the General Manager of SiliconNet Technologies Sdn Bhd (centre) with the students at the ICT Camp Lawas. LAWAS, 4 November 2008: Lawas is this year’s venue for the Rural ICT Guided Home-based Technopreneur (RIGHT) Student ICT Camp. The event is jointly organized by Sarawak Information Systems Sdn Bhd (SAINS), Kemanterian Pembangunan Luar Bandar Negeri Sarawak, Pejabat Pelajaran Daerah Kecil Lawas and Sekolah Menengah Kebangsaan Lawas. The 3-day event is held from 29 to 31 October 2008. A group of 120 students from Form 3 to Form 5 classes of SMK Lawas, SMK Sundar, SMK Trusan and SMK Merapok attended the RIGHT ICT Camp. Mr. Teo Loon Tong, the General Manager of SiliconNet Technologies Sdn. Bhd., a subsidiary of SAINS running the RIGHT program, was onsite to present the prizes and certificates to the participants during the closing ceremony at SMK Lawas. The ICT Camp with the theme “IT in U” is an educational workshop conducted by candidates of the RIGHT programme. Working with the local education offices of the area, the Camp exposes students in rural schools to the components of computer hardware, tools, software and networks through lectures, demonstrations, group case studies and quizzes. wins the trophies for the ICT camp programme. The student from SMK Sundar, Zulfadli mentioned the ICT camp programme benefits him on the use of the ICT application in his daily activities. “I had gained the knowledge in using the computer more efficient and effective”, said Zulfadli. According to Mohamad Faridenan, SMK Merapok, the programme also provides him with good ICT knowledge and hands on skills on the used of internet. The Principal of SMK Lawas, Cikgu Johari Bahar was delighted that Lawas was chosen as the venue this year and was grateful for the commitment of the State Government through SAINS to assists the rural students in Lawas to have a better knowledge of ICT and to instil the importance of ICT skills to reap greater economic benefits and value in a k-economy society. 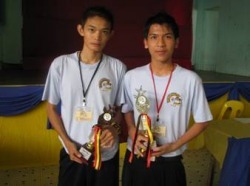 A similar event was held in 2007 at SMK Limbang for 100 students. The RIGHT programme, which was launched in 2006, provides a holistic approach targeted to bridge the urban-rural digital divide on a sustainable basis. It involves leveraging the wide range of specialised ICT skills in SAINS, its established Technical Support Units at the Divisional level, as well as the reach of SarawakNet from Kuching to all sub-district levels. Sarawak Information Systems Sdn Bhd (SAINS) was incorporated in 1991 and has grown to be one of the leading system integrators and solution providers in Malaysia with services ranging from IT consultancy, software development, networking, systems engineering, project management, IT training, data conversion, multimedia content development, facility management and operations support. Information on SAINS can be found at http://www.sains.com.my.